Fatigue refers to the constant feeling of tiredness, weakness, and lack of energy. It is one of the most common symptoms of menopause and affects many women through their transition. Fatigue can be caused by hormone fluctuations during menopause, but it can also be triggered by a number of outside factors. It is essential to maintain a healthy and balanced diet in order prevent fatigue because the foods you eat help determine how energized you feel, and some, like the ones below, provide much more energy than others. They not only taste great, but they serve as healthy snacks for you as well. Walnuts, almonds, and pistachios are rich in protein and fiber, making them an excellent energy-boosting snack. Also, certain nuts may reduce the risk of coronary heart diseases thanks to their omega-3 content. Salmon is a good source of protein and omega-3 fatty acids, which have been known to help fight fatigue. Several recent studies have found that salmon contains small bioactive protein molecules (called bioactive peptides) that may provide special support for joint and control of inflammation in the digestive tract. Avocados provide essential nutrients, including fiber, potassium, vitamin E, and B-vitamins. Avocadoes offer “good fats”, which provide energy and help rebuild cells. Likewise, avocados are sodium and cholesterol free. They are filled with protein, vitamins, and minerals. Eggs are an excellent source of iron and zinc, help keep you full longer, and offer endurance throughout the day. A perfect way to start a day, oatmeal is a whole grain that provides fuel for the brain and muscles and helps keep you full longer to sustain energy levels. These legumes are rich in fiber, which takes longer to digest and promotes a feeling of fullness. Beans are also a good source of magnesium, which helps the body rest and restore energy. In addition, recent research has shown that black beans provide special support for digestive tract health. This fruit is another great source of fiber, making it an energizing snack. Plus chewing this crunchy fruit increases blood flow to the brain and head, which increases energy levels. Mushrooms offer B-group vitamins, which are essential for converting food into energy. Mushrooms also contain components that turn into vitamin D, a nutrient many people do not get enough of. Mushrooms also help strengthen the immune system. Try to cut back on foods high in sodium and saturated fats that dehydrate the body and cause fatigue. It is also important to avoid skipping meals, which causes blood sugar levels to drop, leading to fatigue. 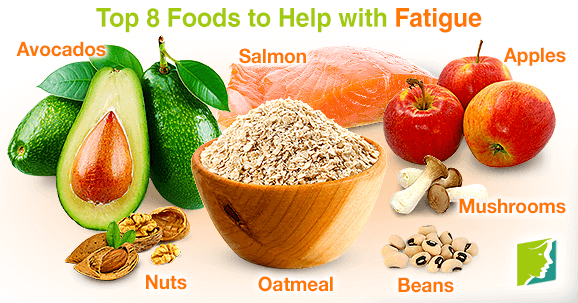 Foods that can help fight fatigue and boost energy include eggs, salmon, nuts, and beans. The general recommendation is to eat small, healthy snacks in addition to three regular meals in order to boost energy levels. Fatigue in menopausal women can be caused by hormone fluctuations; however, fatigue can have many causes, so if your fatigue persists, it is important to see a doctor. Fatigue may be a symptom of menopause, but women should not have to live with it. Click here to learn about herbal remedies that may be able to help. Learn all about crashing fatigue during menopause so that you can manage it in an effective manner and go back to having an improved quality of life.